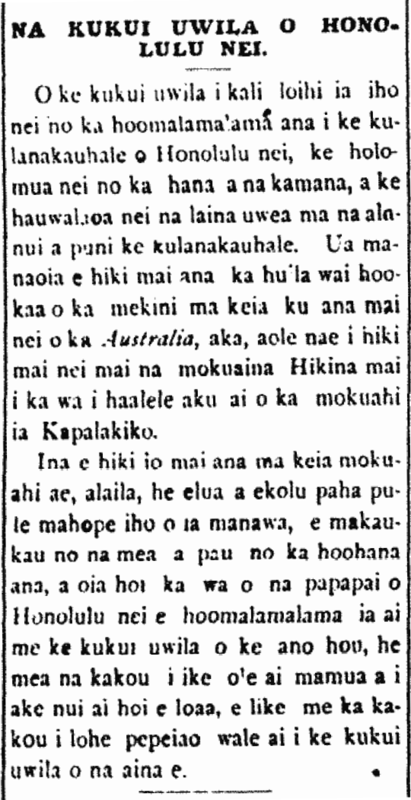 More on Emily Kaihumua and the Australia, 1894. The things you can find on the internet these days! Look at this excerpt taken from the Immigrant Ships Transcribers Guild’s page! The six Hawaiians (plus one more) that left Honolulu for SF aboard the Australia mentioned in the previous post!! 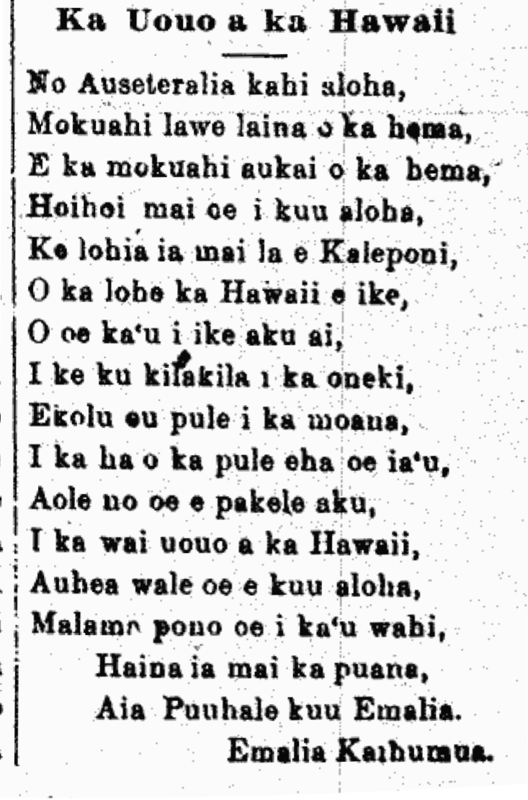 Six Hawaiians, including Emalia Kaihumua, headed for San Francisco 1894. A little after 12 noon, this Saturday, the Australia left full of cargo for San Francisco. It carried 10,659 letters and 5,000 newspapers, and this was the most by far. The value of the domestic cargo is $26,976. Amongst the passengers were six Hawaiians: J. B. Pakele, Emalia Kaihumua, J. Shaw, and some others. The wharf was festooned as it always is. Ka Makaainana, Buke I—-Ano Hou, Helu 6, Aoao 8. Feberuari 5, 1894. ELECTRIC LIGHTS OF HONOLULU NEI. As for the long awaited electric lights to illuminate this town of Honolulu, the work of the carpenters is progressing, and the electric wires are projecting out in every direction on the streets all about town. It was believed that the turbine wheel for the machine would arrive on this landing of the Australia, however, it did not arrive from the Eastern states when the steamship left San Francisco. Should it arrive aboard the next steamship, then it will be perhaps two or three weeks after that when everything will be ready to put it to work, and that will be when the presses here in Honolulu will be lit up by modern electric lights; it is something which we all have not seen before and have greatly desired, like of what we’ve heard of the electric lights in foreign lands. 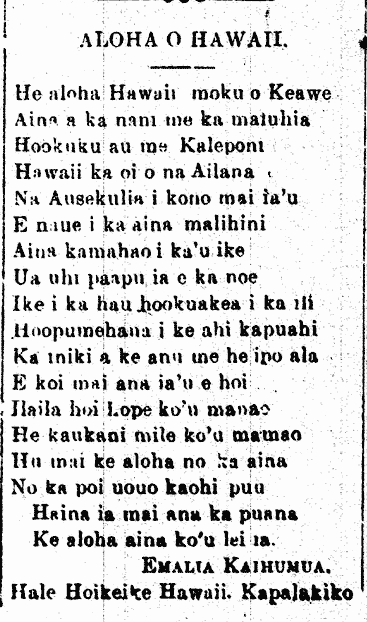 Ka Nupepa Kuokoa, Buke XXVII, Helu 6, Aoao 2. Feberuari 11, 1888. Excerpts of “Strangling Hands…” appearing in the Hawaiian-Language Newspaper. 1897. NA LIMA KAKAUHA MALUNA O KA PUA-I O KEKAHI LAHUI. For the benefit of our readers, we are taking some ideas printed in the newspaper San Francisco Call, written by the pen of Miss Miriam Michelson, on the deck of the ship, Australia, on the 22nd of September. Remember that this woman newspaper reporter was the woman reporter present at the meeting of the Patriotic League of Hilo held at the meeting house of the Salvation Army in Hilo Town, and this is what she reported: . . .
Ke Aloha Aina, Buke III, Helu 42, Aoao 6. Okatoba 16, 1897. Ke Aloha Aina, Buke III, Helu 42, Aoao 7. 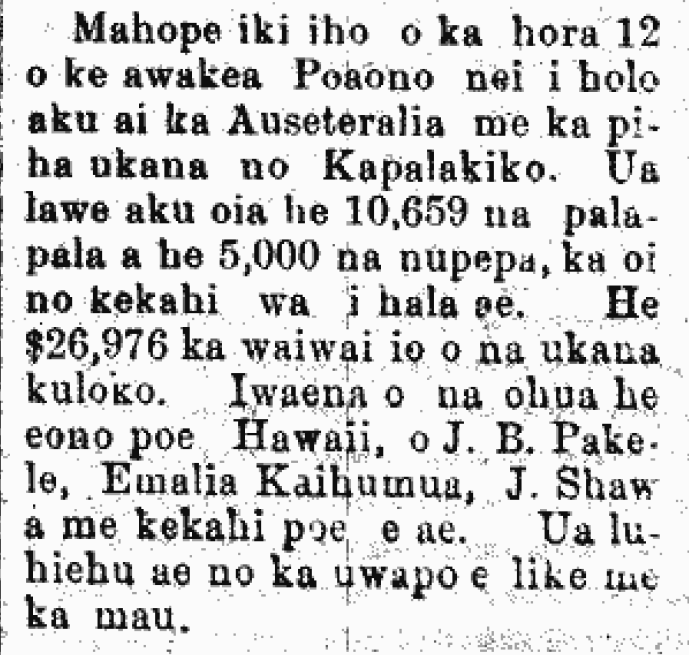 Okatoba 16, 1897.